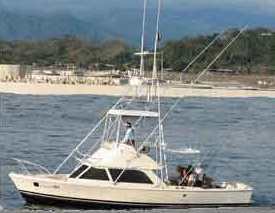 This 31ft Bertram Classic with freshly rebuilt twin 350HP Caterpillar diesels, fighting chair, tower, outriggers and marine toilet is out of Pez Vela Marina in Quepos. Experienced Captain Merlin Badilla is at the helm. The fishing gear is all Penn International and Okuma, with a large variety of teasers and lures. She carries a Garmin GPS Si-Tex sounder and an I-com VHF for electronics.